Well, this is a hard one. Terrence Malick’s The Tree of Life is certainly divisive: I’ve heard poncey critics call it a masterpiece equal to any other, and I’ve read reports of punters across America walking out of the movie theatre, all complaints and confusion. To be fair, I’ve also heard enough critics go against it, but there doesn’t seem to be much of a middle ground here. There are, in general, two opposing camps: those who think it’s a masterpiece, and those who think it’s just navel-gazing. I kind of think it approaches being a masterpiece, but that it’s held back at times by its reliance on navel-gazing. While many aspects of the film are strikingly affective and accomplished, at times it’s too nebulous, too grandiose, and undeniably ponderous. So join me as I take something like the middle ground in my own poncey way. Actually, now I mention it I’m not sure navel-gazing is the right word, though I’m also not sure it’s a good idea to second-guess myself at the very beginning of a review, and yet here we are. So, navel-gazing: that phrase really implies, at least to me, an intense or prolonged bout of unnecessary introspection. But The Tree of Life is at its best when it’s being introspective. It’s when Malick attempts to move from the personal to the grand, the epic, that I think the film falters. Early in the film we’re moved suddenly away from a series of simple scenes showing a married couple (Brad Pitt and Jessica Chastain) finding out about the death of their nineteen year-old son, and transported to an entire dramatisation of the formation and life of the universe. Stars and planets are formed, dinosaurs display untoward levels of empathy towards one another, and so on and so forth. Then we’re back in the care of the O’Briens, and we watch the lives of the mother, the father, and the three young boys (chiefly the eldest, Jack, and the middle child R.L) for most of the remainder of the movie, except for short scenes where an adult Jack (played by Sean Penn) remembers these younger days and thinks painfully of his brother. So, uh, yeah. Dinosaurs. It’s kind of hard to get away from that once you start thinking about it. It’s clear that Malick is trying to make a film that encompasses pretty much everything about life and the world around us, and there’s not anything wrong with that, per se, but this sequence feels overwrought, and is undeniably long and ponderous. It’s initially pretty interesting, but it soon starts to feel like it doesn’t need to be there, at least not for such a long time. And I think it was a colossal mistake to include a sequence about the life and death of dinosaurs. It made a big, silent What come to my mouth, and instead of turning into a How, a Why, or better yet a Hmm... it just stayed an unhappy What that was repeated until the bloody dinosaurs went away. In essence, I think the problem with this sequence, and with a good number of others wherein vaguely religious platitudes are whispered dramatically over various images of nature, is that they (a) feel like something you’d find in a student film that’s trying very hard to be profound, and (b) don’t really seem to have any connection to what the movie is about. In a very big way The Tree of Life purports to be about one thing, when it’s not really about that thing at all. But I’ll get back to that in a second. So onto the bulk of the movie: Malick explores the lives of this family expertly. I imagine its setting (a suburban neighbourhood in Texas) and the details of the children’s lives will play far better to many Americans, having shared similar upbringings, than to an Englishman such as myself, but even without the resonance brought on by such personal recognition I can still say that this depiction of a childhood, and family life feels entirely real, and it’s clear that Malick is bringing much of himself to the screen here. The vast majority of the film is like this; slow-moving, understated, and lacking in any real sense of conflict or narrative urgency. There is conflict between the strict, somewhat embittered father and his children, as well as conflict between the father and the mother, but most of the time it’s just bubbling softly under the surface, and it’s tempered throughout by long stretches where very little happens. It’s not about a narrative, or a sense of conflict, however. Malick captures the feeling and the place of the family-life, and reveals Jack’s views of the world around him, especially his parents, and how this changes. All it is is a long examination of a family’s life, and I guess the film portrays a very slow fall from a kind of prelapsarian family life and childhood into one that’s tinged more and more by tension and conflicting desires. I happened to find this section, the vast majority of the film, to be hugely touching, interesting, and rewarding, though I take it that many people have taken less kindly to Malick’s attempts to eschew the traditions of narrative cinema. Personally, it really just drew me in to some kind of non-intellectual state where the images and the scenes came towards me in a happy trance (Ponce). The characters and their interactions with one another come into their own almost immediately, and much of the interest comes from the tension on an intra- and interpersonal level. 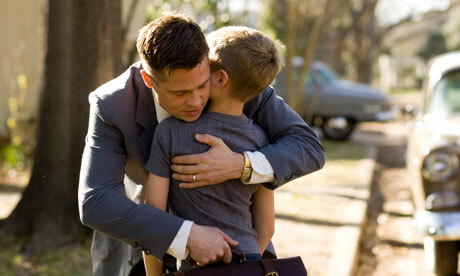 Pitt’s father figure is flawed, very obviously so, but in a complex and understandable way. He’s loving but severe, and somewhat unpredictable. He’s also clearly, clearly going to hit home for a lot of people. Chastain’s mother figure is an angelic, floaty, red-haired beauty, and she’s kind, loving, and wonderful to a fault. And though it’s easy to criticise this level of deification of the mother figure found in so many novels and movies it is going to hit home powerfully to a lot of people: Chastain’s character isn’t necessarily perfect, but that’s how her young children see her, especially when contrasted against their father. The mother is also the subject of much of the film’s cinematographic love, with many of the film’s most wonderful shots revolving around her, from soft images in the twilight to a strangely jarring, but moving flight of fancy that, considering it now, will probably annoy a fair few people. Going on from this: the film is really just awash with striking shots, and sequences. Malick seems to have a love-affair with dawn and dusk; the early illumination of twilight, and many, many of the film’s scenes are found outside, at the very end of the day. This decision, and the film’s general reliance on naturally-lit sets leads to minute after uninterrupted minute of beautiful moments. Malick’s also taken throughout by scenes of nature, and these are indeed impressive. Getting all rubbish and poncey again for a minute (but, you know, really quite rubbish and poncey): these otherwise incidental shots of nature seem to serve as contemplative dividers that separate two scenes, and allow the audience to contemplate the previous scene briefly, much like the technique often employed by Yasujiro Ozu in his films. Other than the uses of nature, I noticed a childish, magic-feeling recurring use of shots of shadows through thin cloth, delicate silk, and there are many repeats of these kinds of visual themes. It’s rare for a film to make me actively notice and comment on the cinematography, not to mention the method of lighting, but when one does it’s because it’s so very visually striking and impressive, like The Tree of Life. It’s beautiful throughout, though I can imagine that others would have far less patience for what Malick is trying to do. And that’s entirely understandable: as I said, it is slow, and ponderous, and a lot of people have called it pretentious (Though, I really think we should put a moratorium on the use of that word until people stop using it to refer to anything that’s a little weird). Where I’m less happy to defend the film is when it attempts to move off from this simple exploration of a mother, a father, and their children, to a an exploration of the entire universe, loss, and the divine. I’m not sure I’ve ever seen so obviously, so unabashedly spiritual movie before. And while that’s certainly not grounds for negative criticism, the way such spirituality is handled is problematic. The film begins with a quotation from Job, and the comparison is obvious throughout. But, as I mentioned before, there are stretches throughout where we hear the adult Jack, and his mother speak fairly meaninglessly over some lovely shot or other of nature. They ask questions of the dead son, and God, and they don’t actually seem to be saying a whole lot. We have choruses of choirs singing inconceivably religious music, and we have a long, spiritual, stretch at the end that I think falls flat onto its face repeatedly. Not only do I think these pieces are managed poorly, (and I think there’s a lot to be said for taking on spiritual and/or existential questions by focusing on real life rather than some terribly po-faced construal of cosmic events) but I think they actually go against what The Tree of Life, by and large, is actually about. The film mentions Job (well, slams it into your face, really), and we know from early on that one of these sons is going to die. But there’s very, very little that actively addresses this. We have the death of a son, THE CREATION OF THE UNIVERSE, a family life, interludes where Sean Penn looks pensively out of a window, and then the aforementioned silly bit at the end I don’t want to talk about in detail. But very little that’s actually about loss, or dealing with it. Overall it’s a film about this family’s life, and growing up, and in many ways some very real magic of existence (one that can be appreciated by anyone, regardless of their religious belief or lack thereof), but it’s not about Job, and it’s not about loss, and it’s not about death. As the title says: it’s about life, and I feel like Malick tried to crowbar a spiritual question and message in where it doesn’t really fit. But God, saying that, it really is something else. I criticise it now, and I couldn’t not, but I really did love it. You have to be patient, and I can understand why few would want to be so patient, considering the film’s failings, but it’s utterly wonderful. It really is shot more beautifully than any film I’ve seen before, except for perhaps There Will Be Blood, and it captures the truth of the lives, and the childhood of its characters. It’s moving and quiet, and clever and masterful, and I really, really did fall in love. But it did flail around a fair bit at times, trying to convince you that it’s got a profound truth, when in reality it’s profound and poignant in a different, more subtle way. It’s about life rather than death, and you can really take as much of the spiritual talk within as you want. You can see it as the real message of the movie if you want, but I see it as window-dressing around the real view. And the view is really worth seeing, even if you don’t end up falling in love with it as I did. Just, I don’t know, try to watch out for the dinosaurs, and try to ignore them if you can. This entry was posted in Film Blather. Bookmark the permalink.